If you’re adventure climber, then your climbing harness is the only friend that matters the most along with your rock climbing shoes and climbing ropes. The climbing harness is the piece of equipment that attaches the rope to your body. Without the harness, you may face difficulty to remain intact and safer during the climb. If in case, you make some mistake while climbing you can trust on your climbing harness. It keeps you safe and stable. So be sure to choose the best one for your next adventure. As a passionate climber finding a reliable climbing harness should always be your first priority. While climbing, if you’re improperly tied in or using an unreliable harness then you’re risking your life as well as other members of the climbing group. So, wearing a quality harness is essential not only for your sake but for the sake of all the climbers around you. Before you buy one, it’s necessary to research and try on various types. But you must be sure about the type of climbing you are up to. Because the harness for traditional climbing, winter climbs, or sporty climbs are different. Besides ensuring your safety, the climbing harness should also provide a high level of comfort. A comfortable harness reduces stress and makes your climb easy!. 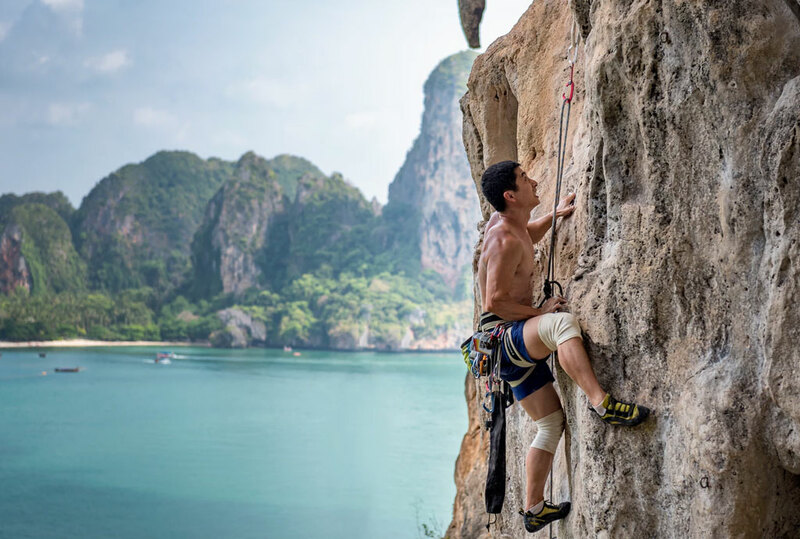 So, before you hit the rock explore the 10 best climbing harness 2019. If you’re planning to invest in a piece of gear that will last through years, then Black Diamond Momentum Harness is the one. It has the features like four pressure-molded gear loop along with haul loop which makes this harness the most popular. It is comfortable, durable, and well designed that suits every climber. It has a bullhorn-shaped waist belt with two bands of webbing. It splits around the waist belt and provides excellent support for climbers. In addition, it fits perfectly in your body despite the variation in body size. This fully adjustable harness ensures a secure fit whether you’re wearing summer or winter attire. Likewise, it also has trakFIT leg loop adjustment. To adjust the loop, you can simply move the slide adjuster along the leg loop’s webbing. The diameter automatically adjusts and provides a wide range with no dangling or webbing. Plus, there are least chances of mis-threading. 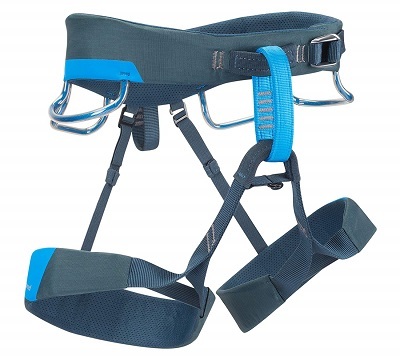 Moreover, this climbing harness also features a bullhorn-shaped waist belt. It helps in weight distribution and thus, making the harness comfortable. At last, this harness is perfect for gym climbing. It is very easy to take off and put on, easy to pack, and comfortable for a long period of time. It is comfortable and easy to use than the other harnesses available in the market. The Adjama harness is lightweight, comfortable, flexible, adjustable, and highly-breathable harness from Petlz. With these multiple features, this harness is a great option from sports to mountaineering. Another important feature of Adjama harness is well-padded waist and leg loops. Both these are adjustable via speed buckles. Also, this harness features elastic retaining loops and prevents flagging down during climbs. The DoubleBack buckles on the waist belt and leg loops provide quick and easy adjustment. They’re ultra lightweight, durable, secure and safe as well. The tie-in points are usually made of Dyneema. It improves resistance to rope friction. As a result, it contributes to make this harness highly-durable. Moreover, there are four equipment loops. Two rigid loops in front for quick and easy access to equipment and two flexible loops in the rear back to avoid the pressure of the backpack. Likewise, ENDOFRAME technology allows excellent weight distributions and full freedom of movement. It also maintains a minimal weight. And, the mini buckle elastic leg loops provide a secure fit despite the size of your clothing. 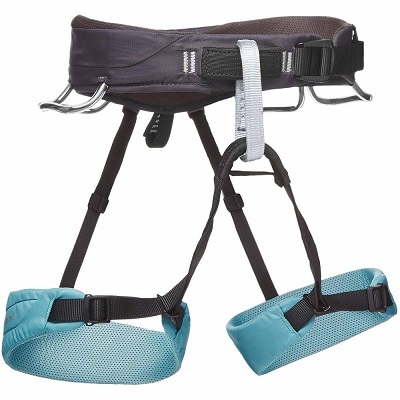 In additions, this harness features ice clipper slots. It accommodates ice clipper accessories which makes it a suitable option for alpine climbs as well as ice climbing. Overall, the Petzl Adjama is very comfortable, well-featured climbing harness. It covers all your climbing needs in one model. Petzl Corax Harness is one of the versatile harnesses. It is a perfect option for every climber from novice to an expert. There is no any loophole in its construction. It is a complete pack that offers security, comfort, and durability. Further, this harness is highly-adjustable at the waist and each leg loops. It is available in two different sizes to fit your properly and safely. The wide waist and leg loops offer you comfort for a whole day. In addition, this lightweight harness has some minimal padding on the leg loops and waist as well for extra comfort. Likewise, this harness features four equipment loops. Two of them are in front and rigid. While the other two are flexible and located in the back. Also, this harness features haul loop in the rear of the harness which makes it hassle-free while carrying. Moreover, the harness is durable because of its simple construction and long-lasting material. It also consists of perforated and mesh foam which promises breathability. With this wonderful feature, you don’t have to worry about the discomfort because of sweat. Petzl Corax harness help to keep everything in the right place. At last, it has dual front buckles which help you to adjust the harness to fit different body size. Black Diamond Primrose Harness is specially designed for the female climbers. Whether you are sports climber or trad climber or gym climber, this harness has all necessary features at a reasonable price. It is a highly-comfortable climbing harness that gives appropriate fit in a woman’s body. This harness is lightweight and has great mobility. So, as you wear it, you will never feel strangled while climbing or belaying. It features a smaller waist and bigger leg loops. Alongside with the extended rise which makes it adjustable to all body shapes. One of it’s the best feature is it has a women-specific bullhorn-shaped OpenAir waist belt. It also has the dual-core construction. It consists of two bands of webbing that distributes the pressure and promise breathability. Also, this harness has a trakFIT leg loop adjustment system. This innovative approach reduces the risk of mis-threading and any kind of dangles. This harness uses simple and secure slide adjuster which help for the quick and easy adjustment of the diameter of the leg loop. In additions, this harness has functional drop-seat clips. It enables you to take the toilet breaks without removing the harness. That’s cool, isn’t it? Whether you’re first time climber or a pro, this female harness will fit you perfectly. 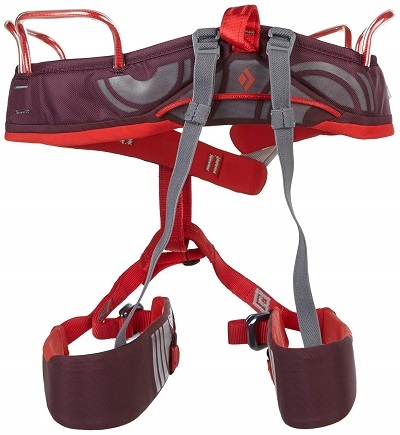 Black Diamond Lotus Women’s Harness is specially designed for all-around female climbers. The quality material and design with an amazing performance make this harness unique from other safety harnesses. It is the best option for indoor or outdoor rock climbing. This is a solid harness that wouldn’t pinch your thigh or waist. It is sturdy, comfortable to wear, and easy to adjust. It fits the people of all ages. Furthermore, this harness has a dual-core XP construction. It offers a balance of comfort, durability, and breathability. This women-specific harness features a waist belt with two thin bands of webbing around the outside of the frame. And an EVA foam which distributes load evenly without any pressure points. Likewise, Black Diamond Lotus Women’s Harness has pre-threaded speed adjust buckles on the waist belt and leg loops. It also has four-pressure molded gear loops and rare haul loop. In additions, this climbing harness has four Ice Clipper slots to hold your tools and screws. This extra feature makes this climbing harness perfect for the year-around climber- from trad to rock, ice, and alpine climbers. 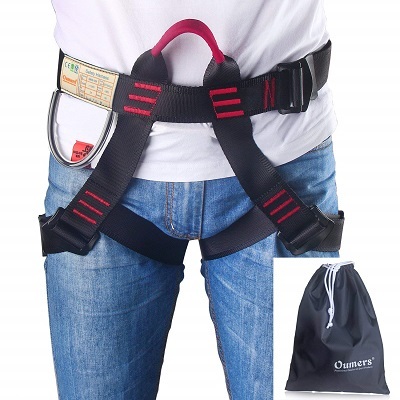 If you’re looking for a quality climbing harness that is affordable and comfortable at the same time then Oumers Climbing Harness is a great option. It is a nice choice for entry-level climbers because of its all-day comfort, ease of use, and best adjustability. Although the design of harness is simple, it is CE certified. This certification reflects the reliability of the harness. This simple looking harness contains synthetic material which gives a great durability. Moreover, double back buckles of the harness provide a great comfort. This feature of harness allows for quick and easy adjustment of waist belts. Thus, it improves the performance of the harness. This harness comes with a breathable mesh lining in the waist belt and leg loops area. So, it is comfortable to wear even on summer days. Furthermore, this harness is lightweight and the pressure on the harness easily splits between waist belt and leg loops. This makes it more comfortable while climbing. You can wear this harness the whole day without any irritation. This incredible climbing harness fits all waist sizes. Since this harness is comfortable it fits everybody- be it men, women or children. Adjustable waist belt and leg loops make it comfortable. At last, Oumers Climbing Harness can handle a lot of pressure so you can use it for different activities like rock climbing, mountaineering, fire rescue, and caving. If you’re looking for a quality harness with a highly-customizable fit then EDELRID- Jay II is your perfect choice. It is another best versatile as well as durable harnesses on our list. This harness comes at a good price. And it celebrates great features and is perfect for either sport or trad climbing. The flexible waist belt allows the front tie-in point and the gear loops are equally aligned. Also, this harness features with 3D mesh padding which provides extra comfort and support. Moreover, for secure and adjustable fit, Edelrid- Jay II has easy glider buckles on the waist belt and leg loops. You can use the movable foam waist padding to align the tie-in point and gear loops. Whether you’re climbing in t-shirts and shorts or layered up, this Jay II harness will be the right fit for you. The harness also features an abrasion protector for extra durability at the tie-in point. This all-around harness has mesh padding that stabilizes the waist belt while the leg loops provide a cushion. Although gear loops are essential for gym harnesses, this product has four fixed gear loops. In this harness, there is an option for attaching winter climbing accessories like ice screw clips as well. Whether you’re sports climber or first-time trad climber, the Black Diamond Vario Speed Harness will fit your needs and budget. It is quite versatile harnesses. You can use it for any kind of climbing, even for rescue purpose. One of the most useful features of Black Diamond Vario Speed Harness is pre-threaded adjustable waist belt buckle. This climbing harness flaunts a well-constructed nylon webbing which makes it tear-resistant. Furthermore, it is one of the easiest climbing harnesses. The buckles are large sized and easy to clean. And, the nylon webbing resists dirt as well. Moreover, it comes with a relatively compact design. You can easily pack and store when not in use as it’ll not take too much space. Lastly, this gear is unisex, suitable for both male and female. Since this harness is easy to use and fits quickly it is a great choice for the inexperienced climber as well. If you’re heading for traditional climbing then the Chaos harness from the Black Diamond is a great option. This Chaos harness is among the most secure harnesses on the market. In this model, a unique kinetic core construction helps to distribute your body weight throughout the harness. In addition, it has the rear haul loop which secures your tagline. Moreover, this harness features four pressure-molded gear loops and front two gear loops are slightly large. It helps you to add the necessary materials. Likewise, the waistband and leg loops work with abrasion resistant outer shell. And the bullhorn-shaped waist belt helps to prevent unnecessary wear and tear. Finally, instead of using the traditional webbing, this harness uses Vectran fibers for strong and more weight distribution. Overall, this Black Diamond Chaos harness has a high level of comfort which makes it good for long multi-pitch routes and trad climbing. The Edelrid Fraggle II Children’s Climbing Harness is one of the most popular children’s harnesses in the market. It is full body harness with great padding that is very easy to use. It securely holds the child’s shoulder and legs to prevent from injury. Also, the entire harness is fully-padded which provides optimal comfort and stability. This harness is so simple that kids can easily put it on and off by themselves. And it is also adjustable with two buckles. Likewise, this kid’s climbing harness is lightweight. Even you can wear it without weighing them down. The full-body climbing harness can hold up to 40 kg. In addition, it comes in attractive colors, your kids would love it. All in all, Edelrid Fraggle II children’s climbing harness is strong, comfortable, and durable. Take it for your child and experience the joy of climbing safely. Whether you’re a beginner or experienced in rock climbing you need to understand that it is very crucial to select a proper climbing harness. You must be sure about the type of climbing you are going to undertake before you buy the harness. Choosing the good and reliable one can be a quite challenging especially for novice climbers. So, it’s important to take your time and select a quality product that fits you right. Nobody wants to invest their time and money on a product that will not suit them. Do you? So, before purchasing the climbing harness you need to consider different factors like its comfort, weight, and its durability. Plus, you should look for the additional features like adjustable leg loops, ice clipper slots, and gear loops. The first thing you need to consider when choosing a harness is what kind of climbing you’re indulging in. With this determination, you can plan the type of harness that suits you. You may indulge into indoor or sports climbing or adventurous ice climbing, mountaineering, or multi-pitch routes or alpine climbs. Here’s a quick review of the different types of harnesses for each style of climbing. If you’re beginner then you may start with indoor gym climbing. This type of climbing focus more on the athletic performance than adventure and usually are a single pitch. This type of climbing requires less gear. Most often the harness for such climbs is thinner and lightweight. If you’re climbing indoors you don’t need to carry any gear so that you can look for a harness with two to four gear loops. 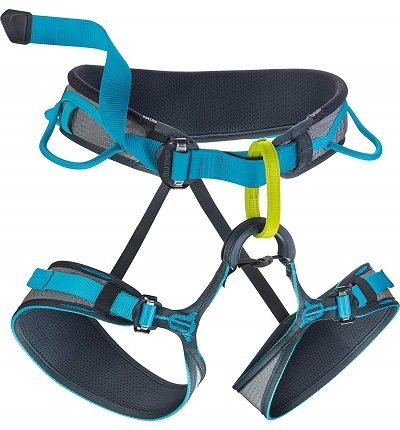 A harness with four gear loop is ideal for outdoor sports climbing. Trad climbing and multi-pitch climbing is the style of rock climbing in which a climber or group of climbers place all gears around to protect against fall. During the trad climbing, you need to carry more gear than a short climb in the gym. For multi-pitch route, you need to bring full anchor setups, rappelling gear, clothes, and water. For that, you should look for a harness with many gear loops. It helps with the effective racking of all your stuff. The thicker harness adds comfort and support for a long duration. Big wall climbing involves a super long and vertical multi-pitch route which may take more than one day. So, you may have to spend the night on the route. Thus, this type of climbing demands high packing. Regardless, for big wall climbing, you need the harness that is comfortable for hanging and rappelling for a long time. Plus, you need to carry an entire rack plus water, food, shoes, hanging tents, and so on. Most of the big wall climbing harnesses are ultra-padded. It also has a super wide waist and leg loops. It comes handy when you go on climbing for a number of days. Ice climbing is another style of rock climbing. Ice climbing harness looks like other climbing harnesses. But it has a key feature i.e., ice clipper slots. These slots are small loops of fabric that hold ice clippers. Alpine climbing is one of the most adventurous types of climbing. It is the form of climbing that combines rock climbing, ice climbing, and glacier climbing. It requires a lot of skills in order to safely climb up a mountain and get down. 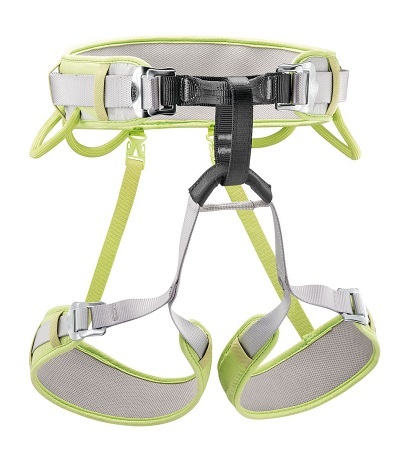 The alpine climbing harness has similar features as ice climbing harness. For alpine climbing, you need to look for a harness with ice clipper slots. The major components you need to look in alpine harness is a comfort, packability, and weight. Another most important factors for differentiating a harness for different types of climbing is it’s features. Here are a few features you need to consider before you buy the harness. Gear loop plays a vital role in carrying the necessary climbing equipment. Carrying your gear around your waist distributes the weight of bulky climbing equipment around the entire belt of the harness. Petzl Adjama harness with two gear loops is perfect for gym climbing, top roping, and sports climbing. While EDELRID- Jay II climbing harness with a four gear loops is perfect for trad, ice climbing, and multi-pitch. Most of the harness has four gear loops. A haul loop is a loop of webbing on the back of the waist belt. The good haul loops are a well-sewn and offer full strength. Since this haul loop lies on the very back of your harness, you can attach items that you may not need while climbing but need to take up with you. Furthermore, the haul loop as a haul line brings up the second rope on longer routes. While for short climb, it’s a great place to carry a water bottle, a small pocket knife, or any other gears that don’t require quick access. If you want strong haul loops in your climbing harness then you can try Black Diamond Primrose Women’s Harness from our list. Note: A haul loop is not meant to hold the weight of the climber. Even if they look strong, you should never use a haul loop as the attachment point for any weight-bearing system. There are generally two options of leg loops: adjustable and non-adjustable. While choosing the harness you need to look for adjustable leg loops as they are great for adding or subtracting layers of clothing. Harness with adjustable leg loops is good for ice climbing and mountaineering where you need to put on the harness over boots and crampons. 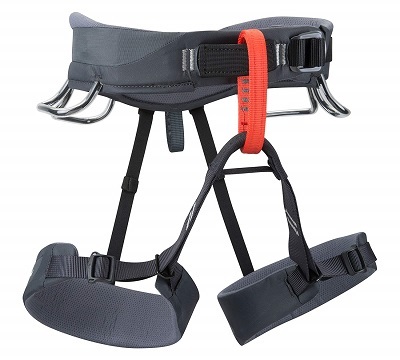 Black Diamond Vario Speed Harness has adjustable leg loops and they can fit well over the multiple layers of clothing. Whereas, the harness with fixed or non-adjustable leg loops is good for sports climbing as most often you’ll wear it over a single layer of clothing. So, if you’re planning for indoor climbing like a gym or in other places that don’t require layered clothing then you can opt for Black Diamond Momentum Harness. Belay loop is a very strong loop that lies in the front of the harness where you attach your belay device via carabiner to belay your climbing partner. If you’re looking for a sport, alpine or ice harness you can look for a skinny belay loop. Whereas for trad or big wall climbing you can look for a fatter belay loop or double belay loop. These elastic straps are especially used to adjust the rise of your harness i.e distance between your legs loops and waist belt. This feature makes a big difference in how comfortably you hang. This is the additional slots available in your harness where you can attach your ice screws. If you’re planning to do ice climbing or mountaineering then you should go for a harness with clipper slots. The Black Diamond Lotus Women’s Harness is the best choice for this purpose for this purpose as it has four ice clipper slots. Also, Petzl Corax harness has two ice clipper slots with adjustable leg loops. Buckles is another important consideration while choosing the best harness. If you forget to double back your buckles you may get seriously injured. So, when you’re using traditional ‘double back’ buckles make sure to pass the webbing back through the buckle to lock off. 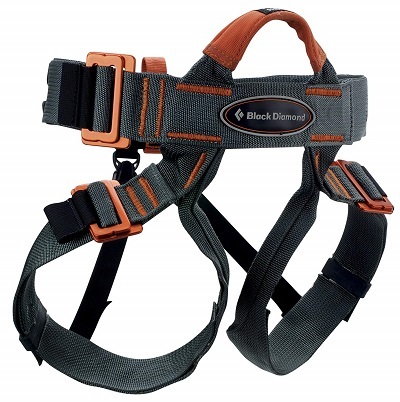 Nowadays, most of the harness like Black Diamond Chaos use auto-locking buckles for quick and easy access. Having a harness that fits you perfectly is one of the most important factors you need to consider while choosing the climbing harness. Many climbing harnesses in the market have all the comfort. They flaunt good quality material but not every harness fits your body. So, it’s very important to take all of your measurements and try on the clothing that you expect to wear while climbing. You need to take those which fit the middle of the waist and leg loop size range. Always make sure that the harness should not be too small so that you won’t be able to move. Leg loops should not be too much tight. You should be able to place a flat hand between your leg and the harness. Before choosing the harness for yourself, make sure to check how heavy it is. Normally the heavy harness has more padding, extra gear loops, and other extra features. Padding in the waist belt makes you more comfortable when wearing them, especially during the summer. However, make sure that all these extra features don’t add much weight to entire harness. Normally, the bulkier harnesses are less expensive but have poor breathability. However, the expensive harnesses are more comfortable to wear with light padding and more ventilation. Since Harness is one of the most important pieces of climbing equipment. You’ll be using it to keep you safe in your adventure. So, you should confirm if the harness you’re planning to buy promises safety features. If you’re an adventure lover or climbing is your passion, then you need a climbing gear that provides safety. The best climbing harnesses will help you to keep safe, secure, and comfortable no matter what type of climbing situation you are into. Besides this, with the correct harness, your rock climbing adventure will be more enjoyable. Whether you’re attempting multiple pitch climbing or simply hanging at the wall in the gym, having the best harness is very important. In conclusion, whether you choose the harness form the above list or anything different, do consider the overall quality, comfort, and reliability of the climbing harness.